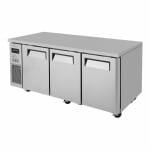 The Turbo Air JURF-72-N undercounter refrigerator freezer has two refrigerator sections and one freezer section. Each section has a polyethylene-coated wire shelf to hold product. The interior is aluminum and stainless steel for simple cleanup and corrosion resistance, while the exterior is made of galvanized and stainless steel for strength. 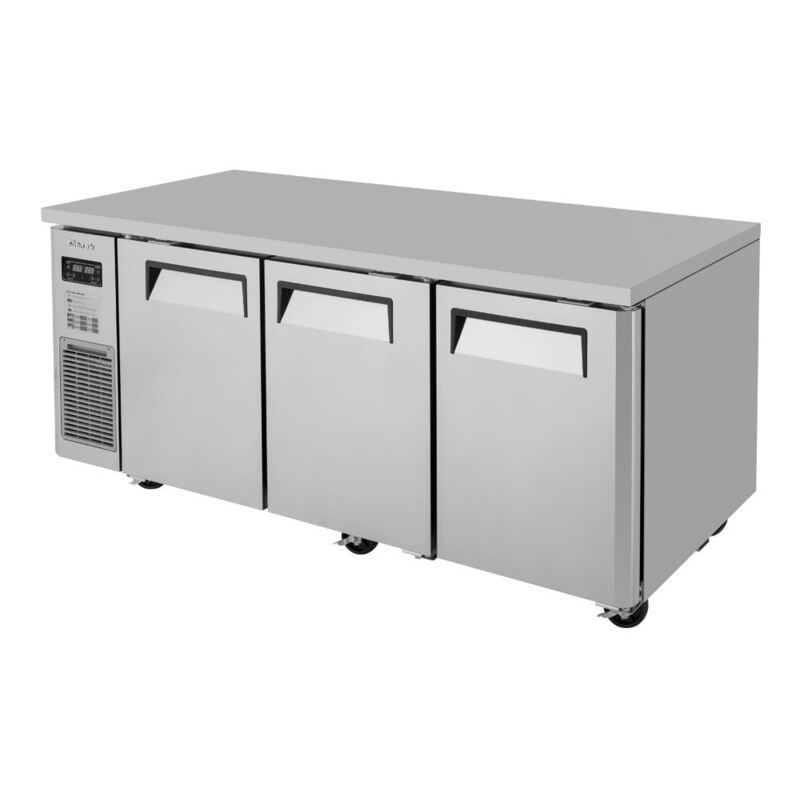 The top of the unit can be used for food prep equipment. The refrigeration system is mounted on the side and built together for accessibility when maintenance is needed. Refrigerator temperature ranges from 33 to 39 degrees Fahrenheit, and freezer temperature ranges from -10 to 0 degrees Fahrenheit. These temperatures are maintained by R290 hydrocarbon refrigerant. The Turbo Air JURF-72-N undercounter refrigerator freezer has a hot gas condensate system to prevent water from overflowing. Left shelf dimensions: 151⁄4 in. x 20 in. Right and middle shelf dimensions: 171⁄2 in. x 173⁄4 in. Features and benefits of refrigerator freezers are laid out in the dual-temperature units article.